Lindsay Gordon Smith c1917. Image courtesy Australian War Memorial. The deceased soldier was accorded a full military funeral, firing party, bugler, and pallbearers being in attendance, the coffin (good polished elm) was draped with the Australian flag and conveyed to the graveside where the Last Post was sounded. It is with feelings of admiration at the gallantry of a brave Australian soldier who nobly laid down his life in the service of our King and Country, that I am directed by the Honourable The Minister to forward to you, as the next-of-kin of the No 1952 Driver LG Smith, 14th Field Artillery Brigade, Australian Imperial Force, the Military Medal which His Majesty the King has been graciously pleased to award to that gallant soldier for conspicuous bravery and devotion to duty while serving with the Australian Imperial Expeditionary Force. During the recent operations East of Ypres from 29th. September 1917 to the present date No 1952 Driver Lindsay Gordon SMITH has accompanied every ammunition party to the guns situate in Hannebeke Valley SW of Zonnebeke and has never once failed to reach the battery position even though he has been subjected to very heavy shelling and delays on the road. This man in company with two other Drivers made nine trips each during one night from the dump to the guns, this despite the severe conditions prevailing at the time. This man has at all times shown a cheerful willingness for any task however arduous and has proved very valuable to the Battery. His conduct is worthy of special recognition. Lindsay Smith was born in Orange in 1889. His parents were William Paynton and Silvia Sarah Eliza Smith. He grew up at Curra Creek near Wellington and attended the Finger Post Public School. In September 1915 Lindsay enlisted at Dubbo. He was accepted into the AIF despite having lost his left index and middle fingers and part of his thumb. 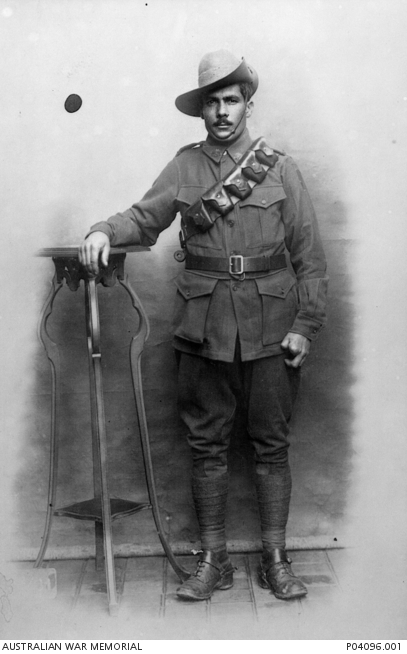 The following month he embarked from Sydney, a trooper with the 6th Light Horse Regiment, 13th Reinforcements. Shortly after arrival in Egypt Lindsay was admitted to the Government Hospital in Suez with mumps. On 5 February 1916 he was discharged to duty and taken on strength with the Mediterranean Expeditionary Force. In March he was transferred to the 25th Howitzer Brigade as a driver, and, in June proceeded to France. Driver Smith served in France with the 14th Field Artillery Brigade, 53rd Battery for two and a half years until his death on 19 October 1918. Lindsay Gordon Smith is commemorated on Wellington Cenotaph in Cameron Park, Yeoval Memorial Hall WWI Honour Roll and on panel number 18 on the Roll of Honour at the Australian War Memorial in Canberra. When the signal to cease was given. Poor guy got so close to the end of the war. If he’d lasted another month he’d have been going home. This entry was posted on October 19th, 2018.